Required of first time customers. This is the basic tuning service. Pianos will be tuned to A440 standard, with custom stretch settings created for your piano. I will also make incidental repairs not requiring parts or removal of the piano action. 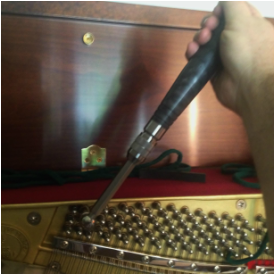 Interior cleaning of upright piano add $25 If you have had a mouse infestation in your piano this may be required as a health precaution before I can service the piano. Interior cleaning is also recommended for families with members who have trouble with dust or other allergies. Cleaning the keybed of an upright adds $35 This involves removal of the keys. Some pianos that have not been tuned in a great while will require a pitch correction, pitch corrections are extra tuning passes which brings the piano closer to concert pitch. These extra passes are rough tuning passes and are done quickly, I will show you with a tuning meter how far out of tune your piano is before the service starts. Pitch Raise passes add to the cost of the service. I strongly recommend that pianos needing a pitch raise be tuned within 6-9 months following the pitch raise. This is due to the instability introduced into the piano by the changes in string tension. After the additional tuning, once per year is usually enough to keep the piano stable. During pitch raises, it is possible that a string may break, I will take steps to prevent this from happening, but I may or may not repair a string that breaks during tuning. A broken string replacement may incur additional cost. Very occasionally (almost never) I do find a piano that cannot be tuned. If your piano falls into that rare category, I will inform you and give you detailed information on the problem and ,if you wish, assist with the purchase of a different instrument. You will be charged for a service call which is $45. *What's a "cent"? - A cent is a unit of measurement used in music to indicate 1/100 of a semi-tone or the pitch difference between two adjacent keys on a piano. 5 cents flat means the pitch is 5% lower than where it should be relative to the note below it. This service is for repeat customers who have had their pianos tuned by Tickled Ivories in the previous 18 months. Having your piano tuned at least once a year is recommended by every major piano manufacturer and piano expert. Regular tuning keeps the piano stable and avoids the extra charge of pitch raising. Cleaning services listed above may also be added. Regular maintenance will prolong the life of any piano and allows me to catch problems before they do damage to the piano. 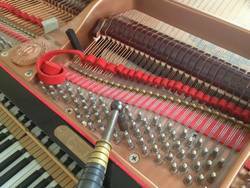 I can also suggest when it is time to have the piano action regulated or that you should have other periodic maintenance services scheduled. It is not advised to wait until the piano "sounds" out of tune as this makes the tuning more unstable requiring pitch raises and more tunings to get the piano back in a stable tune. A preliminary scheduling of the Maintenance Tuning can be made at the end of your first tuning. My basic service area is a radius 30 miles around Covington,KY. 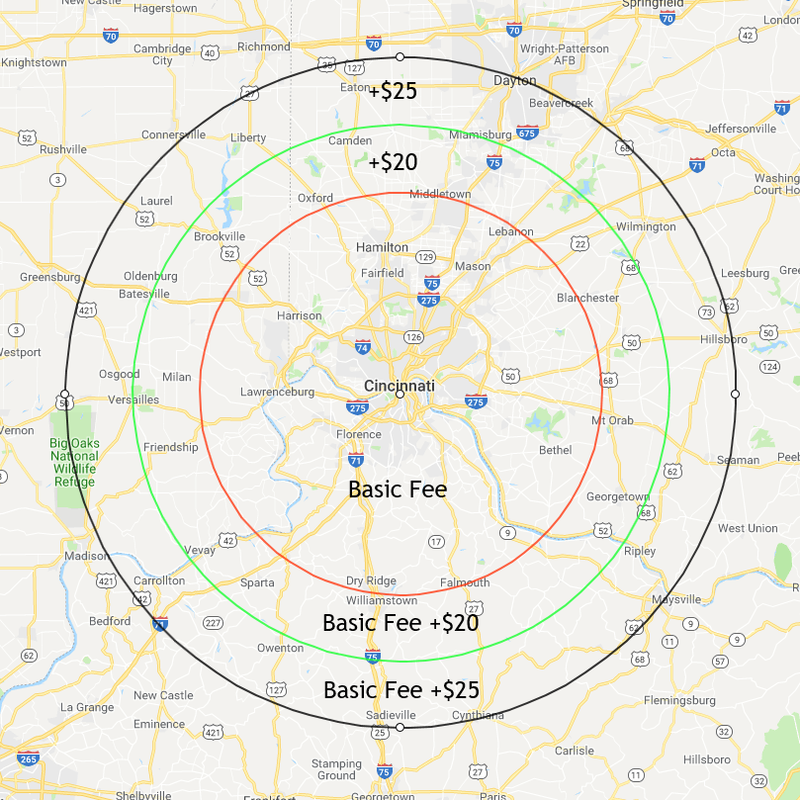 If you live within the 275 loop or the Cincinnati Urban Region the basic fee applies. I don't mind coming out to the cpuntry a bit, though I do need to cover costs for gas and travel time. Use the below map to see which area you fall in, since it is a radius using GPS may not be an accurate measure. Get a nearby friend to schedule on the same day and I can wave the fee. If you reside outside of my basic service area please calculate the Distance Fees according to this map. Regulation refers to the adjustment of the piano action, this is the mechanism that causes the hammer to strike the strings when the key is pressed. There are many adjustments involved in piano regulation. A piano should have the regulation checked every 5-10 years. Sluggishness or weakness in the keystrokes indicate the need for a regulation. There are several levels of regulation I can provide for a piano from just getting the mechanism working to rebuilding the action. Cost will depend on the type of piano and the level of regulation needed. I can determine the level of regulation/repair needed through a basic tuning, please schedule a basic tuning to start the process of getting the action mechanism back into shape. Tickled Ivories Piano Service is a trained certified installer of the Piano Life Saver System by Dammp Chaser. This system is a humidity control system that maintains the moisture content of a piano within a certain level. This adds stability to the tuning and years of life to the piano. I readily recommend these systems for churches, performance venues, and homes where humidity or dryness is an issue. Dampp Chaser Systems are only sold with installation by a Certified Installer. Give your piano a new smile! If your keytops are yellowed, cracked or even missing I can replace the keytops with a new set. Choose from economical modern materials to give your keyboard a uniform appearance. Or upgrade to the most modern materials available that mimic the look and feel of ivory keytops and last much longer without yellowing, cracking, or killing elephants. Tickled Ivories will replace single ivories on a piano with another ivory keytop, if a match is available. However I do not use Ivory or Bone materials when replacing the entire set of keytops on a piano. If you have a teaching studio or a performance venue, it is very important to have your pianos tuned several times per year. When pianos go far out of tune they are much harder to return to a stable tune. I offer Service Contracts for customers who have several pianos that need to be regularly tuned or pianos that are used in performances. The advantages of a Service Contract are deep discounts on tunings and repairs, after hours and emergency tuning/repairs, event tunings and free consultation services if you have need. Contact me for details.